Praised by the Ottawa Citizen as “Outstanding - no, make that astonishing”, TorQ Percussion Quartet was formed by four Canadian percussionists looking to add new vitality to percussion repertoire and performance. Renowned for their engaging performances and repertoire, members Richard Burrows, Adam Campbell, Jamie Drake and Daniel Morphy are committed to making new music accessible to audiences that span generations and geography. Past winners of the Mississauga Arts Council’s Emerging Performing Group award, TorQ has performed to critical acclaim and standing ovations in every province in Canada and beyond, including performances at the International Percussion Quartet Festival (Luxembourg), Ottawa Chamber Music Festival, Indian River Festival (Prince Edward Island), Stratford Summer Music, Open Ears Contemporary Music Festival (Kitchener, ON), Elora Festival and the Percussive Arts Society International Convention (Indianapolis). They have been featured as touring recital artists with Jeunesses Musicales Canada, Prairie Debut and Debut Atlantic, and their collaboration with Soundstreams Canada and the Stuttgart Chamber Choir lead to premieres of Paul Frehner’s commissioned work Corpus in Toronto, Ottawa, Edmonton and Mannheim, Germany. Most recently they presented concerts and masterclasses in Oklahoma and at the Colburn Conservatory (Los Angeles) and the San Francisco Conservatory of Music, and presented the Canadian premiere of John Luther Adams' percussion quartet Strange and Sacred Noise. Summer 2014 will see them return to Stratford Summer Music as Artists-in-Residence, and they will make their debut as soloists with the Toronto Symphony Orchestra in 2014/2015. The members of TorQ are committed to promoting new Canadian music. They have commissioned pieces from noted composers such as Christos Hatzis, Nicole Lizée, Peter Hatch and James Rolfe, as well as up-and-coming composers Monica Pearce, Chris Thornborrow and Elisha Denburg, among others. 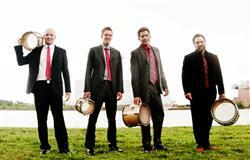 Each member of TorQ has also composed and arranged numerous works for the quartet. Also strong believers in the vital importance of music education, TorQ performs approximately 70 school concerts per academic year with Prologue for the Performing Arts, and are on the faculty of the Durham School Board Integrated Arts Camp. They are co-directors of the summer TorQ Percussion Seminar, an 8-day chamber music intensive for advanced high school seniors and college-level students. For more information, please visit torqpercussion.ca.